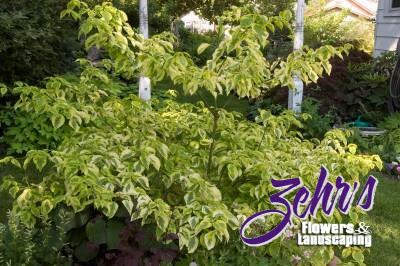 This marvelous pagoda dogwood in a tree form, offers foliage of bright golden yellow, marked with dark green at the center of each leaf. A spectacular show in spring, when the leaves first unfurl, fragrant white blooms flower in early summer. Some blue-black berries appear in autumn, attracting songbirds. A tree with multi-season interest, not to be missed. Plant in areas with filtered light or morning sun and afternoon shade. Own root.